Season the chicken breasts with salt and pepper. Heat 2 tablespoons oil over medium-high heat in a saute pan large enough to fit the chicken. Saute the chicken for 3 to 4 minutes, turning to evenly brown. (You might have to do this in batches.) Remove to the bowl. Add the remaining oil, and saute the onions for 5 minutes or until softened and lightly browned. Add the mushrooms and peppers, and saute for another 3 to 4 minutes or until slightly softened. Add the garlic and cook for 1 minute. Pour the red wine into a pan. Bring to a boil, stirring and scraping up the browned bits. Add the marinara sauce, diced tomatoes, herbs, and salt and pepper, to taste. Bring to a simmer over medium-low heat for 10 minutes or until the sauce is thickened slightly and no wine taste remains. Add the reserved chicken and braise on medium heat for about 20 more minutes or until the chicken is opaque and cooked through. Add the balsamic vinegar and olives and cook for another 3 minutes or until the olives are heated through. Taste for seasoning. Place on a platter and serve with penne pasta or rice. Gently shape the burger meat into 6 thick patties with an indentation in the center of each one. Refrigerate until it’s time to grill. Prepare a barbecue for medium-high heat grilling. Just before grilling, season the patties with salt and pepper. Grill the burgers for 3 to 4 minutes on the first side, and then flip over and cook for 4 to 6 minutes on the other side for medium rare or until desired doneness. (If topping with cheese, add it a couple of minutes before the burgers are done so the cheese can melt.) Grill the buns. Heat the oil in a large non-aluminum casserole over medium-high heat. Add the onions and saute for 10 to 15 minutes, or until well softened. Stir frequently. To serve, place the burgers on toasted buns and top each burger with a tablespoon of caramelized onions. Place the lettuce and tomato on top, and finish with the top of the bun. Serve immediately. Arrange the condiments in a shallow basket to serve. Figure about a half-pound per burger, and handle the meat lightly so it will be juicy. If the meat becomes very compact, the burger might resemble the texture of meatloaf more than a moist burger. I put an indentation into the middle of each patty so that the final hamburger ends up flat rather than round. It is also helpful if you are putting cheese on top. Just before cooking, sprinkle with coarse salt and freshly ground black pepper. Make sure the fire is medium-high heat, and not too high, because you can end up with a charred, but raw, burger. Turn the burgers after 3 to 4 minutes and not until they release easily from the grill — a sign they are ready to be turned. How long you cook them is up to you. While the burgers are finishing, place the roll halves on the grill to warm them and give them light grill marks. To prepare the marinade: Combine the marinade ingredients in a medium-size bowl, and blend well. To prepare the ribs: Place the ribs in a jumbo plastic-sealable bag. Add the marinade to the ribs and marinate in the refrigerator for 2 to 24 hours, turning occasionally. Place the ribs on a piece of aluminum foil large enough to wrap tightly without any holes. Place the package in a large roasting pan and bake for 1[1/4] hours. Alternately, place the ribs in a roasting pan and cover well. 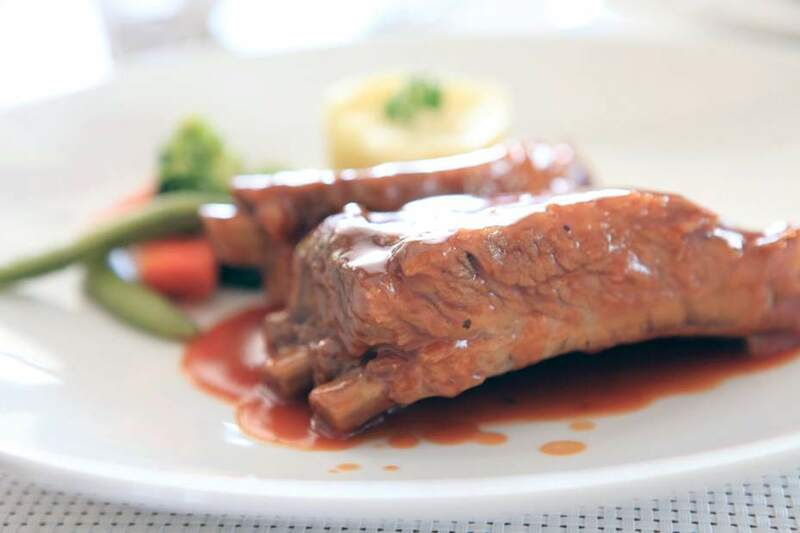 The ribs should be tender when pierced with a fork. Remove the ribs from the oven. Remove the ribs from the foil, drain and reserve the juice and place in a dish. Prepare the barbecue for medium-heat grilling. Grill the ribs about 3 inches from the flame for 5 to 7 minutes on each side, or until they reach the desired doneness, basting occasionally with the remaining marinade, making sure they do not burn. Place on a serving platter and serve with the reserved juices, if desired. When selecting ribs, I prefer the meaty and less fatty baby-back ribs, sometimes called loin ribs. They have a covering of meat over the bones and also between them that makes them leaner and meatier than spareribs. They are shorter and smaller than spareribs. They are a bit more costly than spareribs but well worth it. Look for racks that have meat on the rack and not a lot of fat. It’s best to buy fresh ribs that have not been frozen. Sometimes, you will find the smallest ribs cut up and called Chinese-style ribs. These are the small ribs from the end of the loin rack. You can substitute these individual ribs if you prefer; these make a great appetizer. Use this marinade on pork tenderloin or chicken. This might be prepared 1 day ahead through step 4, covered and refrigerated. Remove from the refrigerator 1 hour before grilling. Place the chicken with the marinade in a large shallow roasting pan. Place the diced yam and leeks around the chicken, making sure to coat them with the marinade. 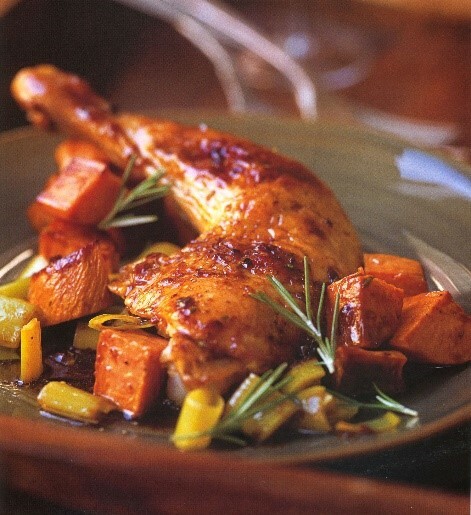 Roast the chicken for 1 hour to 1 hour and 10 minutes or until the chicken is cooked through and no pinkness remains and the skin is brown and crispy and the yams are tender. (You may need to remove the breasts earlier since they cook faster than other parts of the chicken. Place on a platter, cover with foil.) When the remaining chicken is cooked remove the chicken to the serving platter. To finish the sauce: place the pan with the yams on the heat, add the orange juice, zest and chopped rosemary and reduce the sauce, stirring it, until slightly thickened, about 2 more minutes. Taste for seasoning. Pour over the chicken pieces and serve immediately. Garnish with more rosemary leaves. The yams add another note of flavor and complete it. If you prefer to serve another starch, omit the yams and cook as directed. Green Beans with Glazed Shallots and Lemon make a fine accompaniment. Serves 4 to 6 people. For the sauce, melt the butter in a heavy medium saucepan over medium heat, add the shallots, and sauté until soft, about 3 to 5 minutes. Add the red wine and port, turn up the heat to high, and reduce by ½ to a syrupy glaze. Add the stock and reduce by a quarter or until the sauce barely coats the back of the spoon. Add the cream and reduce for another few minutes, until it coats a spoon. Add salt and cracked pepper and taste for seasoning. Reserve the sauce. Prepare a grill for medium-high-heat grilling or preheat the broiler. Grill or broil the steak about 3 inches from the heat for about 4 to 5 minutes on each side or until browned but still rare. Place the steaks on a carving platter, season lightly with salt and pepper, and spread the top of each steak with a thin coat of the olive paste. Cut the steaks into ½-inch-thick slices. Spoon some sauce onto a serving plate and place the steak slices, slightly overlapping, on top. 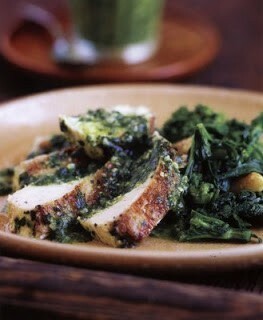 Garnish with watercress or parsley and serve immediately. The sauce can be prepared up to 4 hours ahead and refrigerated. Reheat gently over low heat. Prepare the salsa: Combine the tomatoes, corn, cilantro, parsley, jalapeno, lemon juice, salt and pepper in a medium mixing bowl. Cover and refrigerate for 1 hour. After 1 hour, drain the salsa and spoon it into a serving bowl. Right before serving, add the avocado and taste for seasoning. In a large skillet with high sides, or a wok, over medium-high heat add 1 tablespoon of oil, swirling to coat the sides. When the oil is hot add the chicken strips and toss every 15-20 seconds for 3-4 minutes or until the chicken is lightly brown and just cooked through. Remove to a side dish. Add the remaining oil and then add the onion and toss for a minute. Add the red pepper and jalapeno chili, and toss every 15-20 seconds for about 4-6 minutes or until the onion is nicely softened. Add the garlic and tomatoes, and cook another minute. Add the lime juice, cumin, cilantro and reserved chicken strips, and bring to a boil for a minute. Add salt and pepper to taste, and then transfer to a serving bowl. 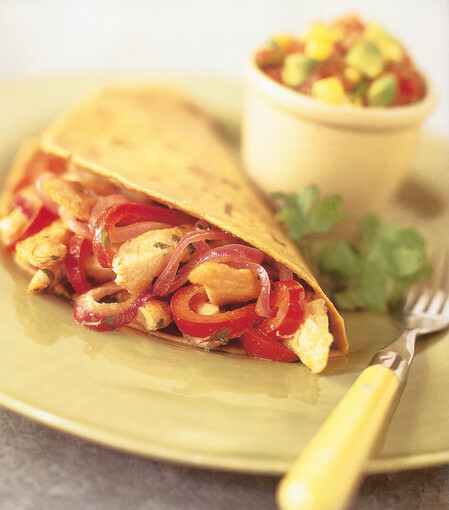 Serve immediately with a basket of warm corn or flour tortillas and small bowls of the sour cream and salsa on the side. The salsa can be made up to 4 hours ahead, covered and refrigerated. Make sure to use a high-sided skillet or wok to help cook the ingredients evenly. This is a very flexible dish. You can serve it rolled in flour tortillas for a quick family dinner, or open-face on corn tortillas for a fun Southwestern-style party. For large groups, you can easily multiply this recipe and add a pot of black beans and some spicy cooked rice to round out the menu. Small bowls of this colorful salsa makes a pretty presentation alongside the fajitas. To drink? You can’t go wrong with ice-cold Mexican beer or fruit Margaritas. In a food processor fitted with the metal blade puree the garlic. Add the parsley and process until finely chopped. Add the oil, vinegar, water and seasonings and process. Taste for seasoning. It should be very flavorful and spicy. Adjust if necessary. Combine the marinade ingredients in a small mixing bowl and mix until smooth. Taste for seasoning. Place the chicken breasts in a zip-lock bag and pour in the marinade. Make sure the marinade is evenly distributed. Zip the bag and refrigerate for 1/2 to 4 hours. Prepare the barbecue for medium-heat grilling. Remove the chicken from the marinade and grill about 3 inches from the flame for 7 to 10 minutes on each side or until no pink color is showing. Place on a platter and serve with the sauce on the side. The sauce can be made up to 5 days ahead, covered and refrigerated. Remove from the refrigerator 1/2 hour before serving. Make sure to barbecue the chicken on medium-high heat quickly so it doesn’t have time to dry out. Cook the breasts with the skin on for a juicier result. And finally, make sure that the breasts are all uniform in size for even cooking by pounding them between sheets of waxed paper.